Given the rumour that Apple is considering split-screen multitasking for the iPad in iOS 8, I tried to imagine how that would work for third-party apps. First of all, a split screen would mean a new layout to design for. As Jared Sinclair explains, AutoLayout will help, but will not automagically make an app support a split-screen layout. For an app to remain good-looking and snappy, “split-screen” has to be a separate mode (like Landscape and Portrait) that apps have to be specially layout-designed for. Therefore, the only way split-screen multitasking would be possible for third-party apps is by an opt-in API. Only apps that know how to layout their screen in a split-screen mode shall use the API and let iOS know about the app’s willingness to participate in a split-screen mode. When the user wants to add an app to a split screen, iOS can list only the apps that have opted-in. Apps that opt-in for the split-screen mode would have more than just a new layout design to worry about. They would at least have to consider three additional stuff: the status bar, the keyboard and gestures from the edge. Before iOS 7, the status bar had a fixed look and was visually separated from the content. Status bar for iPad Safari before iOS 7. Starting with iOS 7, we have a transparent status bar that blends in with the app’s toolbar or content. An app can dynamically choose the visibility and style for the status bar, based on the look of what lies next to the status bar. Status bar for iPad Safari in iOS 7. 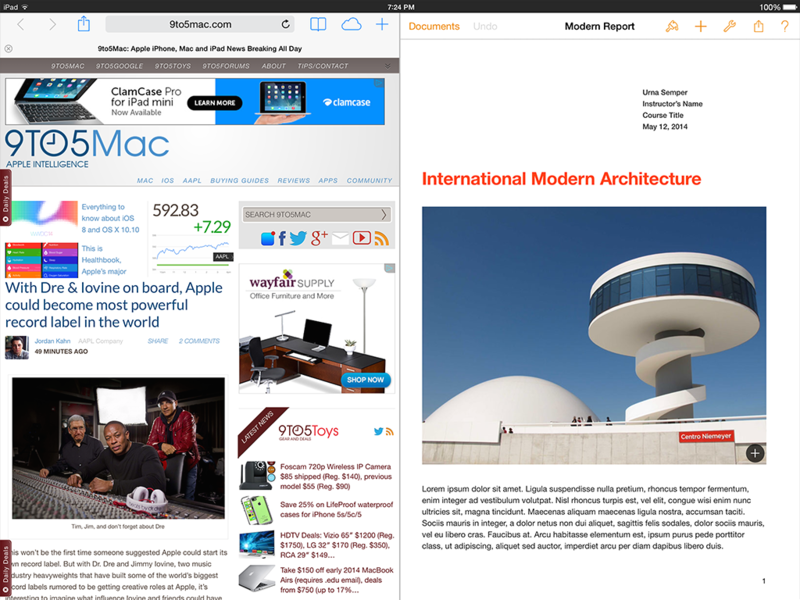 Default (top) and in private mode (bottom). The mockups I have seen all seem to assume the second method and feature an un-iOS-7-ish visually separated status bar. But then, it would be unlike Apple to go back on a design feature they just introduced last year. Either way, apps will probably not be given a choice of status bar style in the split mode, and developers will have to design around this limitation. For split-screen multitasking to be really useful, the webpage on the left should be scrollable so that the end of the page is visible above the on-screen keyboard. (Otherwise, we will have to keep dismissing the keyboard to see the content.) To do that, Safari would have to adjust its views when the keyboard is opened, even if the keyboard is triggered by another app. iOS already notifies apps when the keyboard opens and closes, so the same API can be used for this purpose. 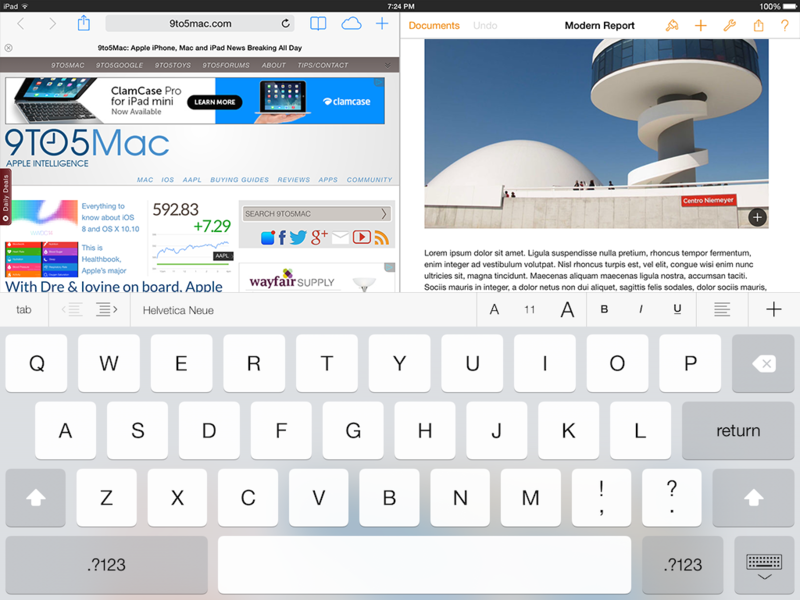 An app that currently resizes its content views to allow for the on-screen keyboard (like Safari) might work as intended without having to make any changes with respect to this. But there are apps with screens that are designed to be scrolled horizontally, not vertically. Like iBooks and Flipboard. Those apps can afford to do that because they don’t have to handle the opening of a keyboard in those screens. For apps like that to participate in the split-screen mode, they might have to freshly implement vertical scrolling. Only then will split-screen multitasking be useful for the scenario of refer-in-one-half and write-in-another-half. So, if an app has a screen that doesn’t scroll vertically, the UX for those screens might have to be redesigned. This is not that big a deal, but still worth mentioning. Some apps do something specific when the user swipes from the right or left edge of the screen, like Paper. In the split-screen mode, the swipe might originate in the “other-half” app, and so the swipe-from-the-edge gesture might never be delivered to our app. An app looking for the swipe-from-edge gesture would have to expose the same functionality using other interactions (which is the right thing to do anyway, irrespective of the “split-screen” mode). The case of the status bar might look like a small thing, but I take that as a significant hint. The iOS 7 transparent status bar works best with one app on the screen at a time. Apple being the company that thinks through well before shipping a design, it’s unlikely that they set the status bar transparent in iOS 7 and change course in the next major version. My bet is that we are not going to see split-screen mutitasking being allowed for third-party apps in iOS 8, at least initially. If at all we’re going to get this feature, it would probably be restricted to some of the Apple apps. This post was discussed in Daring Fireball, iOS Dev Weekly and Reddit. Hide & Seek is a Safari content blocker I made that lets you search Google and Bing as a logged-out user, while staying logged-in in other Google and Microsoft services.